The Rediffusion systems provided several 625-line TV channels on cables containing multiple twisted pairs. Signals were received at a head-end location and re-modulated onto VHF for distribution around the cable network. Each subscriber had a tap-off box outside with a multiway cable to an internal selector switch and VHF-to-UHF converter. Different installations carried different selections of channels, but a typical system included a couple of radio stations, BBC 1 and 2, and whichever ITV franchises could be received in the area. (Back when the Rediffusion system was popular, ITV franchises differed far more in programming than they did now, so having the choice of several was an excellent selling point for the Rediffusion system.) DigitalSpy poster StewartG remembers the Hales Place installation carrying BBC Radio 2 and 4, BBC 1 and 2, and Southern and London ITV. 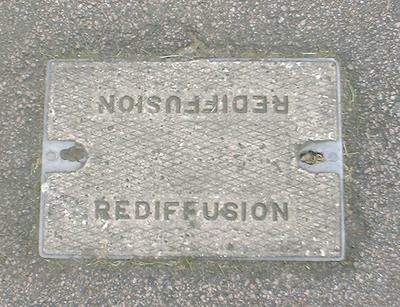 Canterbury's installation was part of Rediffusion South East. The head office was initially in Orange Street, with the Chief Engineer being Eric Parkin, and moved to Rediffusion House, Maynard Road around 1970 (which featured a "Television by Rediffusion" sign). The main showroom was on the corner of Burgate and Longmarket, where Moss is now — a newly-developed area when it was built. The reception site was on the other side of Thanington Without. On the London Road estate and off Wincheap, the Rediffusion cabling was clearly added after the houses were built; a multi-core cable is strung rather messily from house to house under the eaves and along garden fences, with road crossings on catenaries between houses. The house tap-offs are in small plastic junction boxes. In the house I used to live in, there was a long cable run from this junction box to the lounge at the front of the house. 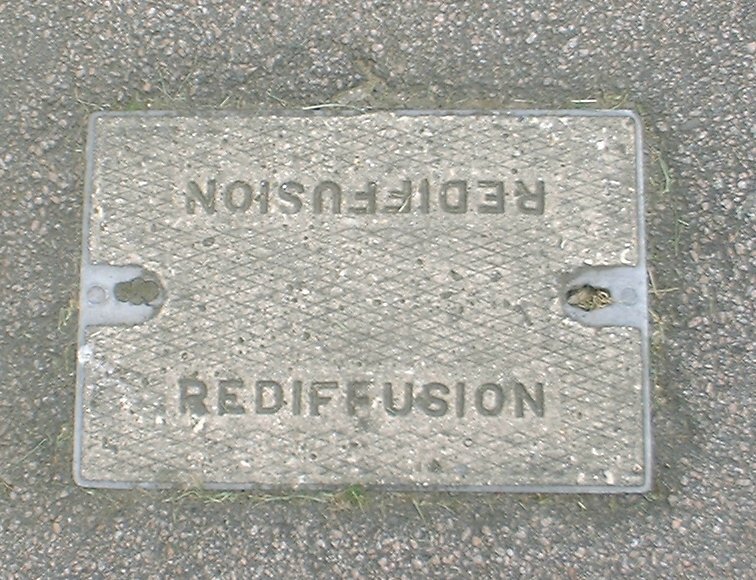 Clearly-marked Rediffusion manhole covers are visible in many parts of Canterbury: I've seen them in Starle Close, around the Wincheap industrial estate (where the Rediffusion offices were), and near Stephenson Road on St. Stephen's Hill. Some parts of the University of Kent — notably Rutherford College — also have Rediffusion installations, with selector switches and outlets still in place (but unused) in the lecture theatres. I don't know if this was related to the system used in homes or just a repackaging of the equipment for distributing video signals around campus. 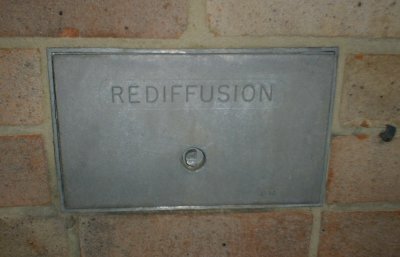 The Rediffusion system was sold to the Maxwell Group and closed down in the late 80s, a victim of better UHF TV aerials and more local relay transmitters. In some towns (such as Hull) the equipment was bought up by different companies and used to distribute satellite channels; in others, like Canterbury, it was simply turned off and left to rot. Analogue TV reception in Canterbury remains spotty even after the demise of Rediffusion; most of the houses originally served by the system now have satellite dishes, or aerials on very long poles pointing at the Chartham relay. Since Chartham doesn't carry Freeview, many have a grotty old aerial pointing at Chartham and a big new wideband aerial pointing at Dover. Many also have FM and DAB aerials, since radio reception is equally poor.